When the credits roll at the end of many films these days the omission is so universal that it is as completely unremarkable and inconspicuous. One of the central characters in movie after movie, in good movies and bad, is absent and un-credited. One of the most powerful engines of plot, driver of motivations, protagonists or antagonists in films, barely rates a mention. It is frequently the location without which the narrative would not have much of interest to play upon or against, and sometimes it is a scene-stealer with its own insistent presence and energy. Cinematographers are drawn to its manifold personality traits, its intensity and brooding stillness, its beauty and gritty unsightliness, its frenetic pace, and languorous moments in between, and to its sinister shadows and surreal netherworlds. The City is never nominated for an Oscar, Golden Globe or Palm d’Or. Every other art form: the story, the play, painting, sculpture, architecture, etc. had its origins in the human experience before the age of great cities. The motion picture alone is a truly modern urban creation. 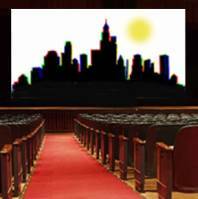 Like the City, the Cinema is a collaborative entity, composed of diverse elements and skills. Only the city could draw together the technology, entrepreneurship, venues for distribution, and audience, which are requirements for the success for a mass art-entertainment medium. But while necessary, these requirements would not be sufficient for the successful relationship between cities and the cinema were it not for two additional elements which the city affords. If the essence ofdrama is conflict, few places afford more possibilities for all forms of conflict than does the City. Since Babylon, Sodom and Gomorrah, cities have been and endless source of stories.